It's been a roller-coaster decade for HTC. Less than 10 years ago, the Taiwanese hardware company was a top-five global smartphone maker, right up there with Samsung and Apple. It was a highly respected brand and established a reputation as an innovator, and this was reaffirmed by its decision to be first to market with a Microsoft-powered smartphone and the first Android phone. Things are different now. During the first quarter of 2017, HTC shipped about 1.5 million smartphones globally, far behind market leader Samsung's 80 million. Like so many other handset makers these days, the company has been consistently reporting financial losses. Selling phones has been profitable for a few companies, but constantly costly for others. How will this continue? For HTC, we believe the fight-or-flight stage as a branded smartphone manufacturer has come. The release of its latest flagship smartphone, the U11, will prompt the company's executives to make some decisions. Is the device special enough to start a rebound? The U11 is certainly an impressive piece of hardware. It's a follow-up to HTC's last flagship, the HTC 10, which was a successor to the One M9. The inconsistent naming of its flagship devices is a branding concern and has led to confusion among consumers and industry insiders. However, a bigger question now is how HTC will position its faded brand name against the top global logos of Apple and Samsung. It takes a large marketing budget to maintain a brand. HTC hopes it can substitute advertising campaigns with several unique hardware specifications. The new device's standout feature is what HTC calls "edge sense" technology, which allows users to interact with the device by squeezing on the sides of the phone. The company's slogan for the device is "Squeeze for the brilliant U", indicating that this is the flagship feature. Users can configure two different actions to perform when squeezing the sides: a short squeeze and a long one. For example, a short squeeze can capture a selfie picture and a long squeeze can turn on the flashlight. Users can also customise the effort needed to activate the feature. The U11 also uses HTC's unique "liquid surface" design for the back cover, a method that combines glass with reflective materials to create a lively look to the phone. It was first used on the U Ultra, but for most users, the stunning finish is likely to be hidden by a protective case. The U11 has a 5.5-inch super-LCD screen, ships with Android Nougat 7.1 running on Qualcomm's Snapdragon 835 processor, has a 12-megapixel rear camera with a f1.7 aperture and a 16-megapixel front-facing camera. There is no 3.5 mm audio jack. Instead, the phone depends on USB-C for audio output, which also enables it to power the included USonic earbuds with advanced audio features such as active noise cancellation. 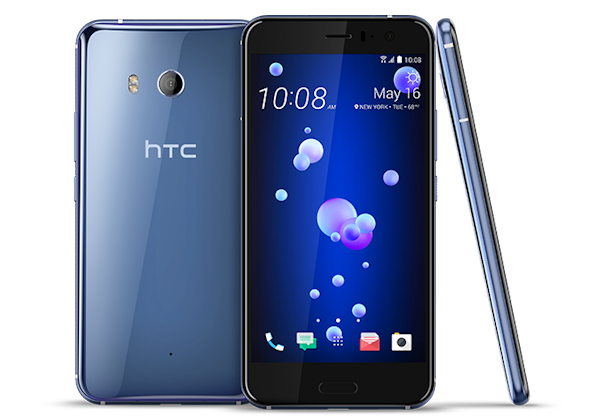 The U11 has a starting price of $650 (through HTC's US Web site) for the 64GB build — the standard entry point for flagship handsets. This means that, for the same cost, consumers can buy an iPhone 7 (a 4.7-inch device). HTC is trying to reinvent itself, focussing on virtual reality as a long-term hope and looking for a fighting chance to remain in the game. For now, we wonder if the U11 is special enough to keep it relevant among consumers. The interactive squeeze feature will generate some attention, but it's unlikely to convince customers. HTC does have other business: in particular, it manufactures phones for Google, which provides it with the opportunity for additional phone volumes. It makes Google's current Pixel models and is expected to be at least one of the design manufacturers for the next iteration of the phones. If nothing else, the U11 shows HTC still has the ability to innovate and perhaps this capability will find its way into devices that it makes for others. The company has a history of being an original design manufacturer and could be going full circle as it gets squeezed out of the competitive flagship smartphone business.